Nurturing the patient-practice relationship is an essential part of growing and maintaining a strong online presence. A happy patient is a built-in advocate for your practice. With advancements in technology and the rise of social media, healthcare practices are going online to find new paths of communication with both current and prospective patients. Engagement with a practice allows patients to feel empowered in their own healthcare journey. Likewise, improving engagement allows you to become more accessible and trustworthy. Furthermore, the patient experience relies on not just engagement but also communication and collaboration. This is where content comes in. A strong game plan for patient-practice relationship highlights opportunities for engaging, educating and empowering patients with digital content. The first step is to identify what the objectives of your content are. This is the WHY that will drive your decision making. Why are you taking this strategy in the first place? What are you ultimately trying to accomplish when your audience sees your content? Be sure to also identify how these short-term goals play into the long-term goals of your overall plan. You want your content (and overall strategy) to be cohesive and fluid. Once you have identified your long-term and short-term objectives, it’s time to figure out how to get there. Now that you have an endpoint in mind, you need a roadmap to your destination. Try thinking about the starting point at which people are coming from and what obstacles may stand in their way to successfully complete the objective you have in mind. Having idea of these elements will help in your mission to create content that is engaging, educational, and indelible. Focus on the experience that you are providing for your audience (future and current patients). You want content that resonates with them and opens the opportunity for interaction. Here comes arguably the most important part of your content strategy: tracking and analyzing. Without proper tracking and analyzing of your goals, you essentially have no strategy or objective for your campaign. Tracking progress and analyzing results is crucial for your practice to see improvement and benefit from outreach efforts. Careful analysis will show you what content is working, what isn’t, channels in which you could improve and channels in which you are thriving. Take this information to heart and use it to make better-educated decisions with your patient-focused content. 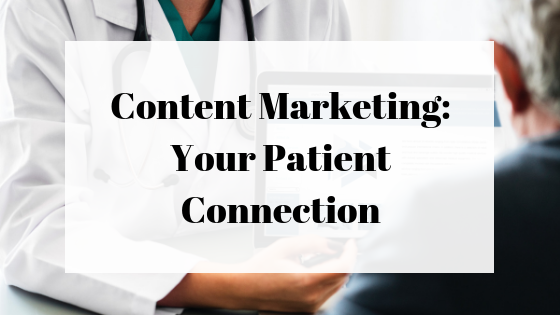 Looking for help with your practice’s marketing content? Contact us here!